The difference between humility and humiliation is choice. I’m reminded of this every time I go to the polls to vote, proverbial blue dot that I am. This year was no exception. Whatever strides progressives made in other parts of the country, that once again got destroyed in South Dakota. I did not vote for a single winning candidate on any level–state, local, national. In retrospect, I don’t think I’ve voted for a winning candidate since 2010, unless you count Barack Obama in 2012, who won the presidency but lost the state in which I lived by 24 points. By one measure, my losing streak is a humiliation, an electoral shouting-down of my political beliefs. I’ve encountered plenty of people willing to couch it in those terms. In the age of no-victory-but-annihilation, and with a barely literate man-child as president, it seems a natural thing to humiliate your opponents. Most days, I think Jesus is just as offended by all of this as I am. And I think I have pretty solid biblical ground to stand on there. I have no hope that God will give me anything I wish. I base my pessimistic assessment on God’s big intervention into human history (according to Christians, at least). The messiah showed up on the scene at a time when things were desperate for the Jews. They were subject to the whims and corruptions of Roman rule, and they wanted God to do something about it. Send a king. Send a general. Send someone with enough influence to make real change. Jesus was none of that. He never even tried. Jesus was playing a different game altogether, infiltrating small spheres with big messages of love and forgiveness and healing. His powerlessness wasn’t an obstacle to overcome. It was an essential tool in his work, a way to model how the kingdom of God comes to us, how we get in on it. All of this has unnerving implications for those of us who want to face down a tyrant, from Nero to Trump and each of them in between. We can resist and sometimes revolt. We can speak against them and vote against them. But our best approach is not to try to beat them at their own game. It’s to love our neighbors in tangible ways, to think big and act small. Seen in this light, no defeat–electoral or otherwise–is really a humiliation. A setback, to be sure, but also a reminder that God chose to fight the tyrants of Jesus’ day not with power, but with humility. If that’s good enough for Jesus, then I suppose I should trust that it’s good enough for me as well. Summer is waning here in the Dakotas. The cicadas are singing its farewell song in the evening so loudly that you can’t even hear the wind. Some of my students have started wearing hoodies on their way to class in the morning. I hear the Midwesterners warning the transplants from the coast just how bad the winter will be. I have a different dread. The world has burned this year, and every indication is that it’s getting worse. I don’t see the large-scale determination it will take to address the carbon emissions that are turning the planet into an oven. I wonder if my children will be part of the solution. I wonder if my grandchildren will even recognize the world in the backdrop of photographs of me as a child. But farmers know that the old saying about reaping what you sow is only half the truth. There are too many factors of rain and sun and soil that you can’t control. You can only play the percentages. By autumn, the crop will be what it will be, and not much more to be done about it. Except to welcome this in-between time, to be grateful for what has grown more than you mourn what has not. To take this season for the good in it, even if much is dying. To honestly and hopefully live this one day. On vacation this week. I’ll be writing again next week. Until then, here’s a thought to ponder from the Truman Presidential Library in Independence, MO. Here in the the Dakotas, we have nothing if not emptiness. I didn’t appreciate the abundance of that resource until my family and I moved to Mitchell, SD, four years ago. The few times I’d been through eastern and central South Dakota, I saw it as pass-through country, nothing more than necessary terrain on the road to somewhere else. But when I took a job at Dakota Wesleyan University, the prairie became not just a scenic backdrop, but a destination. My new hometown is not exactly an outpost. Mitchell is home to two schools of higher education, a world-renown tourist attraction, a Walmart, and a Cabelas. At about 16,000 residents, we are the sixth-largest town in the state. Compared to much of South Dakota, Mitchell is downright urban. These are all relative, boasts, however. We’re still a small fish in a vast, sparsely populated pond. if I bike three miles in any direction from my house, I can be on backroads that carry only a handful of cars each hour. If I drive west past Chamberlain, across the Missouri River, I can find even greater solitude, miles and miles with nothing but wind and wildlife. That may sound romantic, and it is–for about fifteen minutes. It’s easy to crave space and silence when you’re living at the break-neck pace of modern American life. It’s natural to think that getting away from everything might be the cure for what ails you. Sunset over the chapel at DWU. If we had more on the horizon, we’d miss the glory of the skies. The reality, however, is that entering into emptiness requires a certain amount of detox. We are all wired to need people, albeit to varying degrees. And with so much connectivity available to us via digital technology, most of us don’t know how to be alone without also being lonely–much less how to be lonely in a spiritually beneficial way. Surprisingly, even in a land with such abundant emptiness as the Dakotas, I don’t find many people who readily defend its merits. Like just about every other place in America, we tend to fill up our time with one thing or another until we’re frantic with activity. Rather than see the emptiness around us as fertile ground for spiritual renewal–the silence as clear air through which to hear the voice of God–we ignore it, except for agriculture. Emptiness is a condition in which we work, not a vehicle for our salvation. Emptiness invites us to open our eyes. To let go of the illusion that our activity makes the world go round. To embrace our smallness and transience, and to find freedom in those things. To embrace a paradox, that a land that seems empty can fill us with a wonder we didn’t know we needed. As soon as I laid eyes on Niagara Falls, I knew I had to message my brother Mike. Mike loves power. All farmers are amateur engineers, and Mike is no exception. Virtually every piece of machinery he owns has been adapted, rebuilt, or somehow modified toward more effective and efficient use of power. His tractors and workshop and even his mailbox all attest to his philosophy, learned from our father: anything worth doing is worth overdoing. So Mike was first on my mind earlier this summer when our family vacation took us to Niagara Falls. This time of year, a staggering amount of water goes over the falls—176,000 gallons every second, descending 188 feet to the river below. On the Canadian side, you can look right over the edge of Horseshoe Falls, the most famous view, and watch the water dive over the edge. A view from above the Horseshoe Falls. This is why I wished Mike were with me at Niagara Falls. Although he loves power, he is also a control enthusiast—a family trait we both share. The thought of careening down the Niagara River, through the rapids and eventually over the falls, relinquishing all control to the forces of nature, makes us cringe. I would have loved to see that inner turmoil on Mike’s face as he wrestled with his passion for power on one hand and his need to maintain control on the other. I feel a similar tension in myself quite often these days—particularly when I read the news*. Every cycle seems to bring word of scandal, blame, lies, hubris, and violence. As I write this, children are being separated from their families at our southern border, detained like criminals even though some are not old enough to tie their shoes. I want to stop this and a hundred other things I read about every day, national sins perpetuated by greedy and thoughtless people who love power more than they love other humans. But I can’t stop anything. Sure, I can call my congressional representatives and vote in elections, but that has about as much impact in my neck of the woods as spitting in Niagara Falls. I can name the atrocities and speak against them, but the current isn’t going my way. For all my outrage, I have no real power. That’s how it feels some days. I have to remind myself that it’s also a lie. One of my favorite things about the stories of Jesus is the radical empowerment of the left-out and looked-over. Jesus spoke about against the atrocities of his time, but he never tried to grab for the power to fix them. Instead he talked to people on fishing boats and hillsides and olive groves, caring for individuals in his path, trusting that they would do the same for others. This was how the fabric of society would change—by making people more aware of and compassionate toward their neighbors. My friend Omar al Rikabi made this point in a sermon to his church in Heath, TX, on Sunday. He doesn’t suggest that we give up on collective action, even political action. Neither do I. Rather, he suggests that the starting point for change is much nearer. Regardless of how powerless we may feel—how strong the current or how threatening the falls—we can still love our neighbors. And that matters, maybe most of all. * I mean read the news, not watch it. Giving up cable news channels was maybe the best mental health decision I’ve made in the last year. I’d highly recommend it. Some memories live in your body, whether you know it or not. This is especially true for strong emotions—love and fear and humiliation. I usually feel all three of these every time one of my college friends posts a throwback picture of me on social media. Anything can trigger one of these visceral memories: a word, a story, a song. I imagine that’s why some of us love oldies stations, and some of us detest them. Remember your Billy Joel: “The good old days weren’t always good.” At least not for everybody. 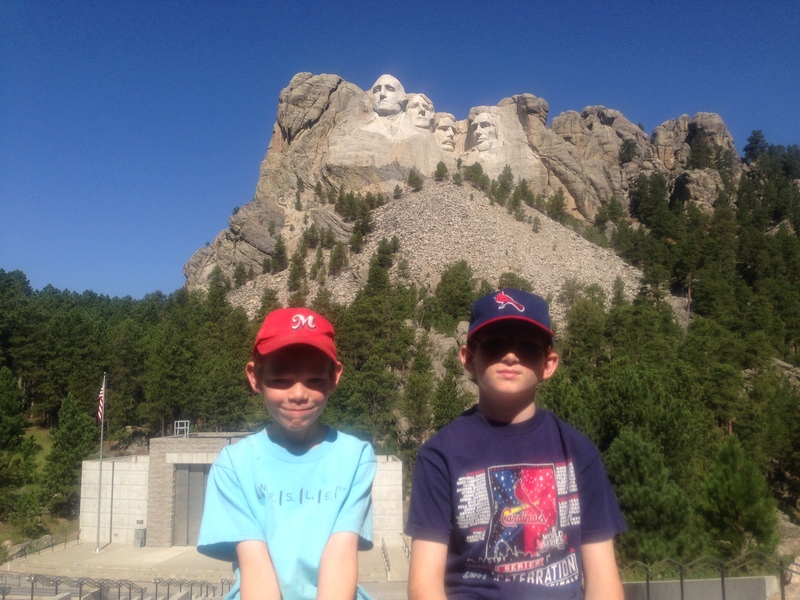 My boys may not remember what they did on their first trip to Rapid City. But I hope they remember that it was a good day, and that we were together. That was my song this weekend on the way to Rapid City, SD, where Denise and I spent two years early in our marriage. We have some shared memories and friends, but our individual experiences were quite different. She remembers the Black Hills as a place of beauty and tranquility. I remember professional chaos, church tension, and a deep personal loneliness. All of this came flooding back to me as we pulled off the interstate into town. I had blocked much of my time there, right down to geography. Denise had to give me directions to every place we went. But I still felt many of those memories, especially as we passed the school where I spent my two most difficult years of ministry. I must have clamped down on the steering wheel, because my forearms were sore the next day. Then I remembered something I didn’t know I remembered, at another place I’d largely forgotten. As we drove toward Storm Mountain Center, a different kind of remembering came over me. 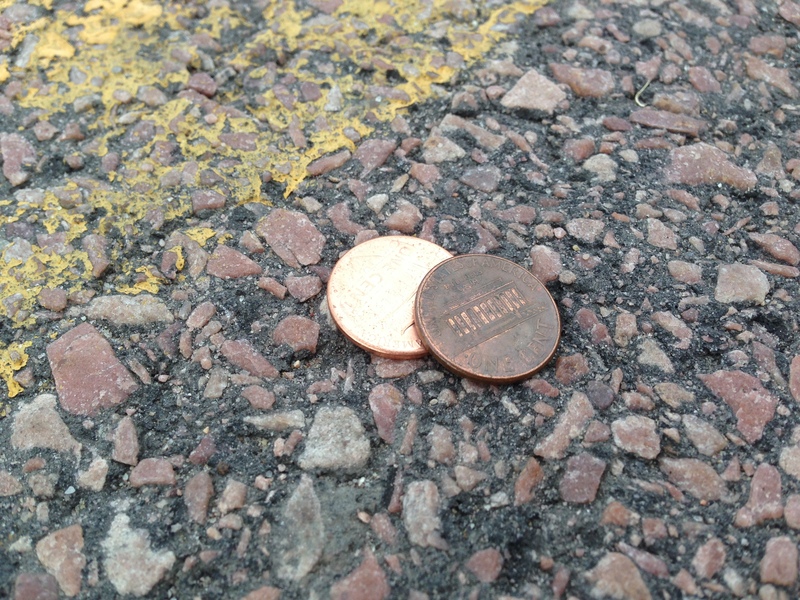 I could feel the tension draining from my shoulders as soon as we pulled into the parking lot. After a fifteen-minute conversation with Scott, the longtime camp director, I was as happy and relaxed as I’d been in years. Part of that feeling, I know, comes from the honeymoon emotions of a new job. But I’m also sure that much of my relief and optimism comes from those decade old memories that were wired into my skin. When I was at my lowest points, I would come to Storm Mountain to hike or cut wood or just find a place to sit. My body still recognized it as a place where things got better, even if my mind was slower to process those feelings. Maya Angelou famously said that people will forget what you say and do, but that they will never forget the way you made them feel. I shudder a bit to apply that to my prior life in Rapid City. It was not the place where I did my best pastoral work. But returning to Storm recasts some of those painful memories, and it gives me hope. Perhaps there are other good memories waiting for me elsewhere in those hills, and perhaps the same resides in old settings and relationships from other places we’ve lived. I love finding unexpected happy memories. Those precious things are already sown, however. I can’t go back in time and plant more, good or bad. They have grown into fruit trees or thorn bushes, and I can’t change their character now. The task for today is to plant good seeds, both for myself and for those I encounter. I may never know the fruits of the planting, but I know that people will remember the way I made them feel. And if I can be part of welcoming someone, someday back to a place they didn’t know was home, then I’ll have repaid a part of what has been given to me.